Why read this report? Keeping up with market changes is an ongoing challenge for business and regulatory decision makers. Whitereport can help in getting on top of this by looking at media industry currencies from a new angle. Media industry currencies nowadays mostly extend to audience measurement and advertising monitoring services. On top of these, however, Whitereport expands the concept by including new market currencies and key performance indicators concerning the financial, commercial and ownership aspects of the entire media market. A full and realistic image of the market reduces the probability of costly and risky misperceptions when making business, regulatory and policy decisions. It also increases the competitiveness and performance of all creative industry stakeholders, from content producers all the way to media providers, and helps them find opportunities that puts their growth on a sustainable trajectory. Who should read this report? This report is for UK business-to-business and business-to-government high level decision-makers, and more generally for anyone who is going to be involved in business or regulatory decisions in the context of the UK media market. Key findings Here are 5 key high-level findings from our annual Cross-Media Reality Check on the top 1100+ UK media companies, analysing data from a broad array of currently available public sources as of October 2017. Weekly aggregated updates of this figure are available for free in the KPI section at whitereport.co.uk, while company level updates can be found in the Whitereport Financial module, which is reserved for our subscribers. Size The UK media market is larger than we think. Focusing on the market of content and media providers (television, radio, print, online, cinema and out-of-home) within the UK creative industry , Whitereport identified 1168 media companies. The “Premier League” of large media companies includes 20 UK firms with a turnover exceeding £300 million, while the reported UK turnover of the top 5 companies is over £1 billion. 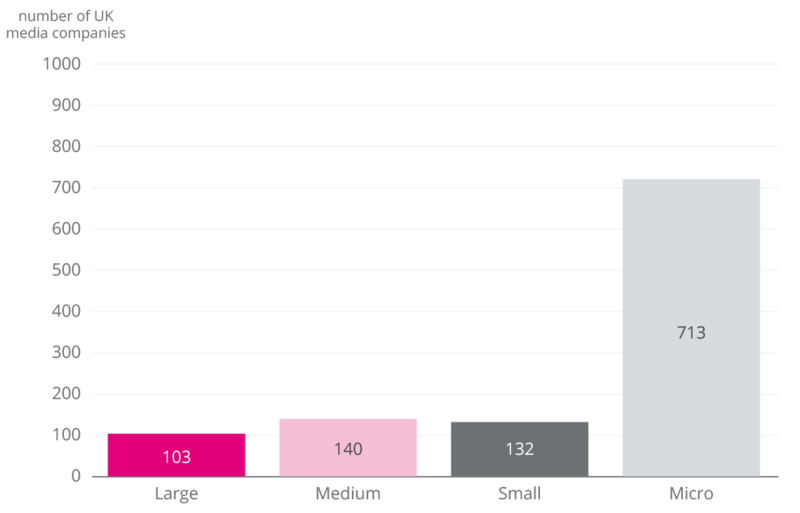 The 1000+ firms that follow the 103 largest companies on the list are SMEs. You will find a longer tail when the further modules of Whitereport become available (including not only companies but also local authorities, educational organisations, churches, etc.) This market structure raises strategic business and policy issues in terms of market regulation, competition, pluralism, diversity as well as M&A and business development activities. Are you interested in finding out more about the total market size or about specific market segments with respect to turnover, profitability, assets, etc.? Do you want to benchmark your financial performance as compared to the average performance of the market overall or specific segments thereof? Check the free Whitereport KPIs or order the full UK Cross-Media Reality Check report for deeper insights. Would you like to take a look at the complete list of 1168 UK media companies? Ask for your free 14-day trial access to the Whitereport Financial Module and get data and insights in a matter of minutes. Media pie Compared to the ’advertising pie’ (net ad spending shares by media sector), Whitereport’s media company turnover analysis is based on all b2b and b2c revenues – including advertising, distribution or any other source of revenue a media company might collect. Despite the trending perceptions about the dominance of the online sphere, the media pie shows that taken together, television and print companies represent 78% of total turnover, 76% of operational profits and 78% of taxes paid by media organisations in the United Kingdom. Are you interested in receiving further insights into the cross-media aspects and segment performances? Order our full report on UK Cross-Media Reality Check. Or would you prefer to analyse the 1168 UK media companies on your own, far more easily and comprehensively than ever before? Ask for your free 14-day trial access to the Whitereport Financial Module. Profit Based on a Whitereport analysis of 372 media companies with operational profits, 30% of UK media companies are not profitable, 80% of those that generate losses are SMEs (small accounts do not have to report profit and loss statements). The map of large media companies below reflects a mature market – with vast individual differences even among the top 103 media companies. The SME market landscape, which looks less favourable, highlights the need to look at issues such as internal and external competitiveness, the role of regulators, capital and business development issues, as well as the financial opportunities that could be exploited in the process of adapting traditional content providers to the digital transformation in order to ensure their financial viability and sustainable growth. Are you interested in seeing more benchmark data to evaluate performance and monitor competitors? Order the full report on Cross-Media League Tables, including rankings by turnover, profit, intangible assets, after tax profits, advertising and subscription revenues, along with many other indicators. Alternatively, contact us for help. Media company millennials ’Traditional’ media companies are powerful – but millennials are here to stay. Almost a quarter of the large media companies were incorporated in the 21st century and represent x% of the segment of large companies in terms of turnover. They are more likely to be online and television content providers than other types of media. Nevertheless, it is important to highlight that older media companies are also engaged in the process of digital transformation. Just like human beings, the ’digitally born’ millennials operate differently from their traditional counterparts in terms of how they deal with challenges and the solutions they apply. Would you like to check out who the newcomers are and how they perform? Order the full Cross-Media Reality Check report, including rankings by turnover, profit, intangible assets, after tax profits, advertising and subscription revenues, along with many other indicators. London London is not only the capital of the UK content & media industry, but it is close to being the media industry: Whitereport data show an even higher level of concentration than the standard methods have suggested thus far. Of the over 1000 media companies, 405 are based in London, and 70% of large media companies operate from the capital, while 80% of media company employees work there. A very significant proportion of turnover, profits and taxes paid by the media industry are also generated in London. ’W’ and ’WC’ areas are home to the most media companies in London. However, this extraordinary concentration is at risk nowadays by the partial move of state broadcasters, the direct and indirect impact of Brexit, as well as attempts by non-UK cities to lure media companies based in the UK by offering them various tax and business incentives. Are you interested in evaluating other locations than London, in making informed decisions about where to locate a media business or arguments to inform debates about media company relocations? Subscribe to the Whitereport database at www.whitereport.co.uk to find out more with the help of Whitereport’s postcode analysis, which provides an even more detailed map. Would you love to see detailed, ready-to-use charts? Let us know! For more powerful insights, please choose our service that best matches your needs and interests. Order the full Cross-Media Reality Check report. The Whitereport database is built and focuses on media brands (primarily content providers) as key components of the industry in terms of generating attention, influencing opinion, and/or generating revenue/profits; from a business perspective, they are valuable assets. Further, they have an impact on media pluralism. In the Whitereport database, ‘the media are understood as including print, broadcast and online media’ as well as cinema and out-of-home media players, to cover all aspects of content and/or advertising platforms available to either the entire UK population or segments thereof. Whitereport’s Financial Module provides data about the companies that own, control and operate the identified media brands (’media companies,’ such as the providers of television content, be it broadcast or OTT, internet and radio content providers, etc., in line with Council of Europe’s ’Recommendation CM/Rec(2018) of the Committee of Ministers to member States on media pluralism and transparency of media ownership, adopted by the Committee of Ministers on 7 March 2018). The database is built on information about media brands collected from public sources. Our know-how ensures that the information thus collected is properly validated and verified.